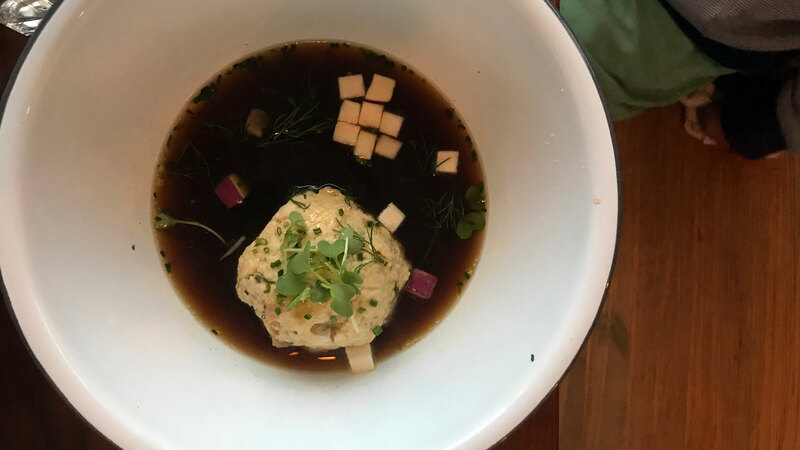 Bone broth and dumplings make any top 10 list of the Bay Area’s current culinary trends and Radhaus combines them into a singular, oh-so German dish: the dumpling. The size of a softball, this dumpling, made of bread and steamed to a pleasing softness, floats atop a savory beef broth, its epic proportions generous enough to be called entrée. After its soak it in the muscularly seasoned broth, this dumpling is the essence of comfort food, taken to a new, trendier place, one that does not shy away from either heritage or robust flavor. 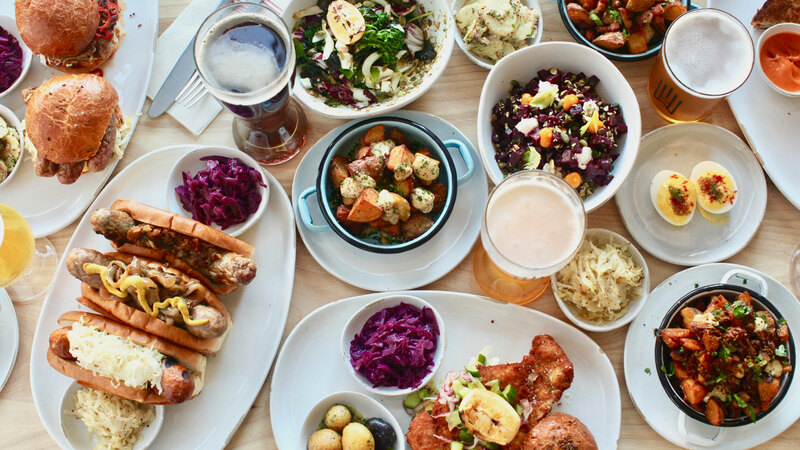 Part Bavarian beer hall, part beer garden, San Francisco’s Radhaus, from the Suppenkuche team, looks more to southern Germany and the alpine border region for its inspiration. 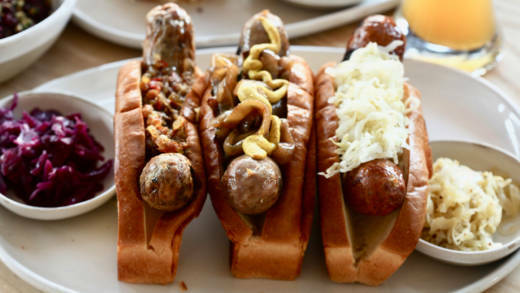 Pretzels make regular appearances – as a side for the Bavarian cheese known as Obatzda or on their own with mustard and horseradish – and sausages from fresh weisswurst to grilled knockwurst get fun makeovers with sides of butternut squash mustard or pork broth. But this dumpling reminds us of what a knödel should be. Curry, the generic term for a blend of spices, is often considered a part of the culinary lexicon of the Indian subcontinent. But curry refuses to be confined or defined, lifting on the trade winds to harbors far and wide. In Germany, currywurst is street food extraordinaire, sold from countless stands and shops on nearly every German street corner and marketplace. Said to be a product of post-World War II innovation from a Berlin homemaker who traded spirits for ketchup with a British soldier, currywurst is so popular, this humble sausage has spawned its own museum. At Alameda’s Speisekammer (a Check, Please! Bay Area alum), owner Peter Kahl amps up the flavor of Germany’s beloved currywurst with a house blend of freshly ground curry. The fiery-hued link is served with a bright red tomato sauce infused with more fresh curry. Could it be enough to convince Californians that this slender tube of pork and veal deserves its own pantheon of pork? Kenji Lopez-Alt knows a thing or two about innovation. Culinary Director at Serious Eats and author of their Food Lab blog, Lopez-Alt understands ingredients and looks for ways to re-engineer cooking techniques to improve the end product’s flavor and texture. 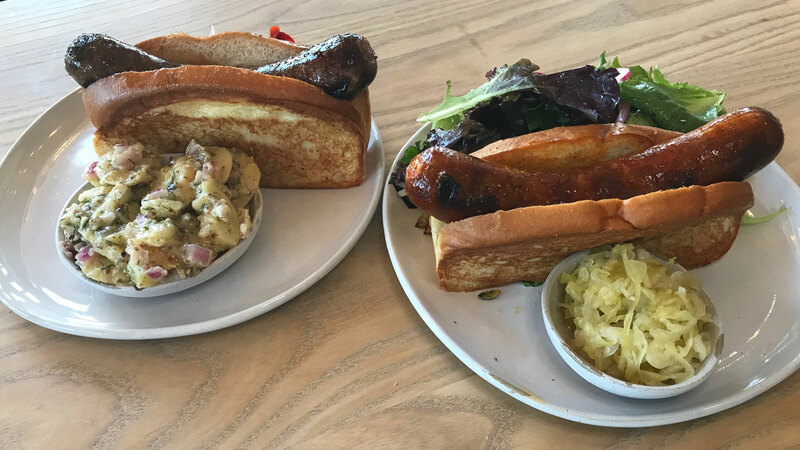 So it is at Wursthall, Lopez-Alt’s homage to sausage and beer (did I mention that sausages pair well with beer?) and a restaurant kitchen with endless opportunities for exploration and culinary imaginings. The first dish to arrive is spaetzle “cacio e pepe.” Above the tiny, wheat-flour dumplings native to the southwestern German region of Swabia floats the cacio (cheese), an airy whip of pecorino infused with the pepe (that’s pepper). The dish is topped with a toasted pecorino crisp, a lid that harmonizes the dish with a snap and bridges the Alps to Italy. Or take a trip across the Atlantic to Mexico by way of the al pastor wurst. A sausage by its German name, this pork wurst, is seasoned with pineapple and enough dried chiles to tickle the palate and encourage a tear or two to spill. Try it topped with kraut for the true California bierhall experience. “The region around Hamburg is Germany’s greenhouse,” said Anja Voth, chef-owner of Berkeley’s Gaumenkitzel. 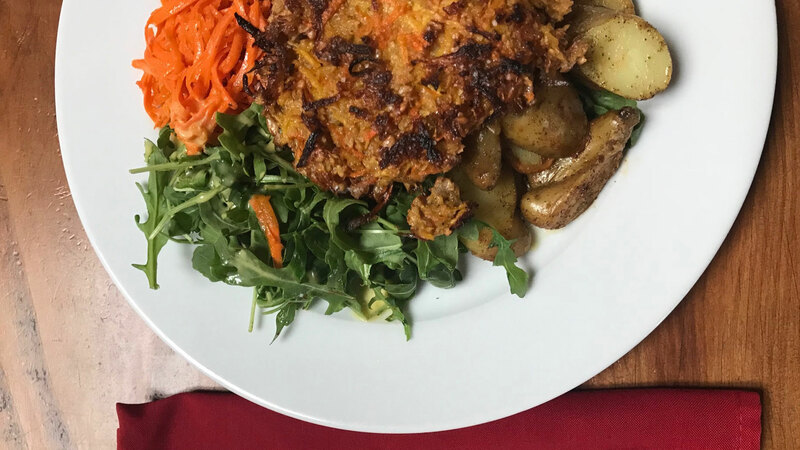 The region’s commitment to agriculture may explain why Hamburg leads Germany’s count of vegan restaurants. But the city’s history as one of Europe’s largest ports also pushes the culinary boundaries of the city. 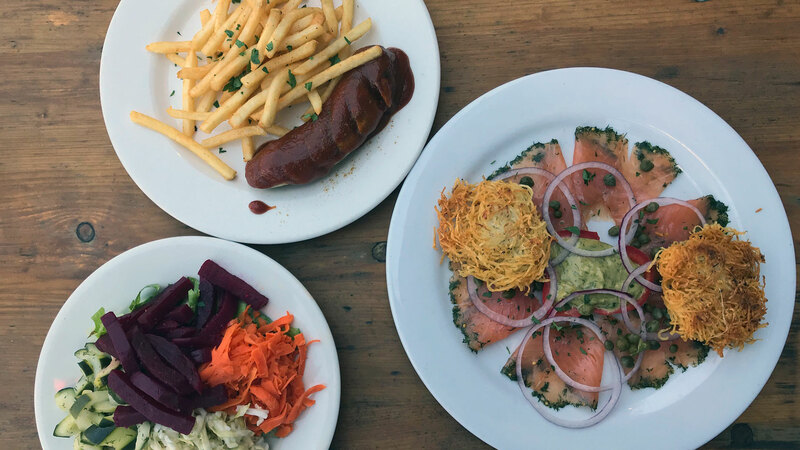 Voth brings a commitment to international flavors and an ethos of cooking with zero waste to the cuisine at Gaumenkitzel. The crispy, pan-fried veggie cake is a throwback to a style of cooking that any maker can relate to. Carrots and parsnips, plucked from the garden hours earlier are hand-mixed with house-milled oats and an egg from a local coop. Voth’s version leaves out the traditional spelt, making the dish lighter and free from gluten. Full-fat butter and olive oil add great flavor and important nutrients. Updated for today’s sensibilities, this veggie cake is impeccably sourced and insanely fresh, making it as relevant today as to anyone living in Hamburg in 1914. Slice the vegetarian schnitzel at Walzwerk in half and marvel at its vibrant purple and orange colors. 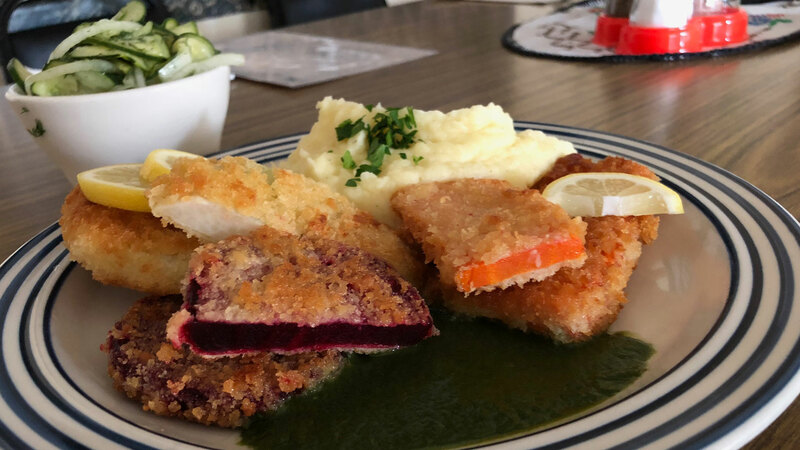 Made with cooked red beets, kohlrabi, and carrots, then breaded and fried like a cutlet made of more traditional pork, this veggie dish may not seem innovative until owner Christiane Schmidt reveals that her mother cooked it often in the former East Germany. “We cooked what we had. We ate a lot of potatoes and cabbage,” said Schmidt. Walzwerk’s menu hews to this sort of traditional cookery, dishes Schmidt ate while growing up. Fresh fruits were rare, beets and cabbage abundant. There was plenty of cabbage, both white and red, then and it makes regular appearances on the menu – wrapped around lentils, served as a salad or as sauerkraut – and this reliance on cabbage inspires a joke from those days. “Especially for East Germany,” Schmidt says “when you went to a store who sells vegetable, you would say ‘the right side is white cabbage, the left side is red cabbage. “ Maybe that explains the dual nature of Walzwerk’s vegetarian schnitzel.